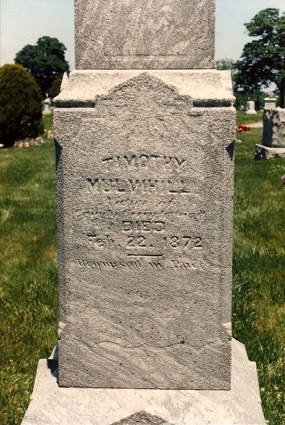 Timothy Mulvihill from Kilbaha South, County Kerry is buried in Mount Saint Mary’s Cemetery in Kansas City Missouri. The first record I have found with Timothy Mulvihill of Kilbaha County Kerry – is the baptismal record of his son Thomas Mulvihill and Johanna Connor dated 1 April 1820. Timothy and Johanna are the parents of eight children that I know of. The oral tradition of this family was that the mother had died in Ireland and then Timothy came to Kansas City. Timothy Mulvihill is found in Griffith’s Valuation, leasing land from Rev. Samuel B. Leonard (Rev. Lenonard is renting from Charles L. Landes, Esq. ), in the townland of Kilbaha South, Parish of Murher, Barony of Iraghticonnor, County Kerry. The only census record for Timothy Mulvihill is the 1870 census. Tim Scantlin (Scanlon) age 25 is a drayman, Bridget (Mulvihill) Moore age 30 has 5,000 in Real Estate. Bridget is the only person on this page to have Real Estate. Bridget owned a hotel in Kanas City at 1218 Baltimore. From marriage records Timothy and Bridget were married on the 8th of January 1870. 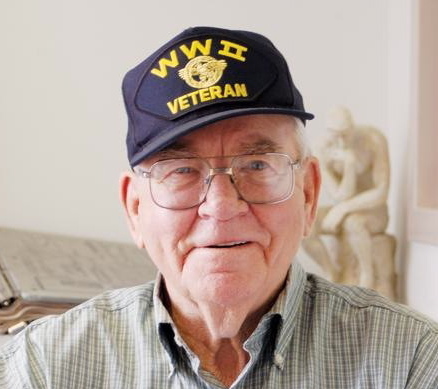 Timothy Mulvihill is listed as being 89 years old. I believe Timothy was about 70 to 72 years old. 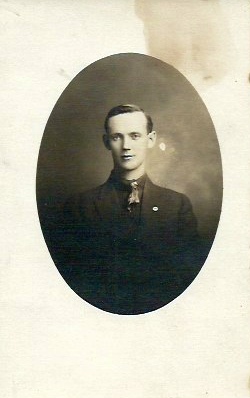 Thomas Mulvihill married Margaret Morrissy and moved to KC about 1865. Catherine Mulvihill married Michael McMahon and moved to KC about 1859. 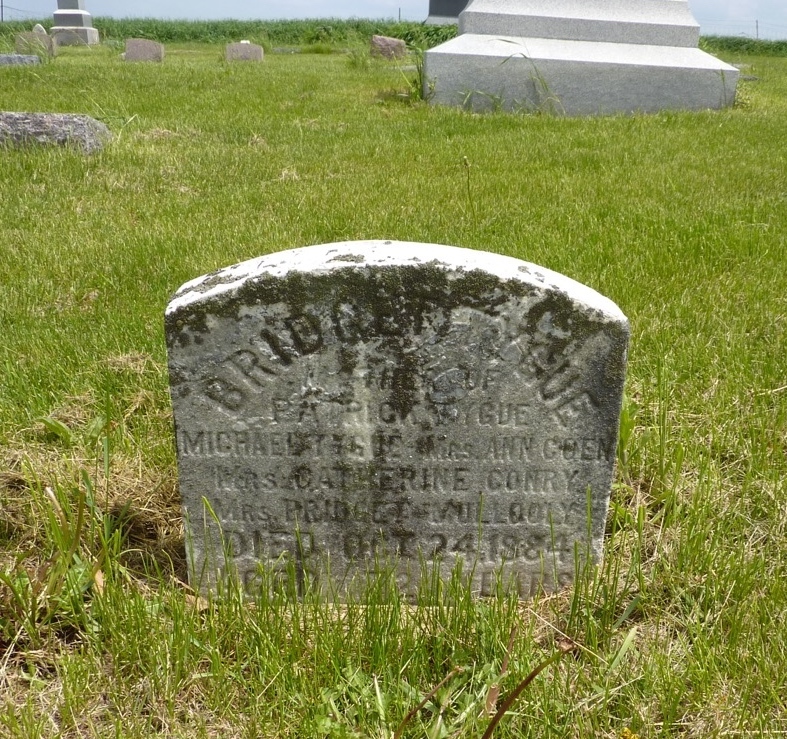 John Mulvihill married Catharine Sheehan and moved to KC about 1856. Bridget Mulvihill married William B. Moore first, then Timothy Scanlon in 1870, she moved to KC before 1860. 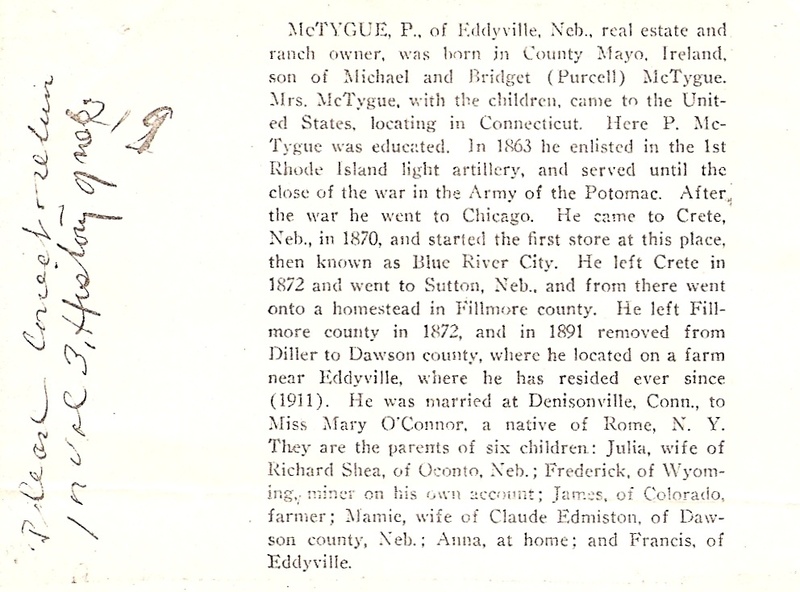 Timothy Mulvihill married Anna McCarroll and had moved to Kasnas City before 1860. Michael Mulvihill married Ellen Clifford and had moved to Kansas City before 1860. Anne Mulvihill married John Madden and had moved to Kansas City before 1860. This has been a fun family to research! Happy St. Patrick’s Day – Today is a Celebration of Heritage and Family! Happy St. Patrick’s Day to all. Today is a celebration of family and heritage. I stop to remember my father – Robert Emmett McTygue who was born on Halloween 1924 and went home to God on St. Patrick’s Day 2013. All of my father’s ancestors came from Ireland and I have had so much fun learning about them. I remember going to Ireland with my parents and being able to introduce Dad to cousins that he had never met. We had such fun. 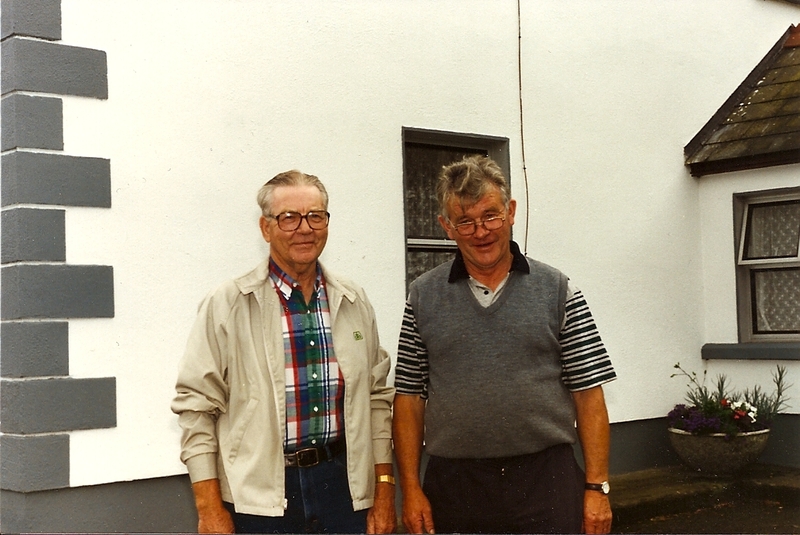 This is a picture of my father and Tom Condron taken in 1990 in Lynally, Offaly- I think Dad looks more like Tom than some of his brothers. Those Neville genes are very strong. My father was very proud of his Irish heritage and he passed that love of Ireland, history and family to me. Thank you Dad – you were the best! Who is your ancestor associating with? How about Thomas & Robert Pim of Tully. Witnessed by Thomas Pim of Tully lying in the County of Kildare Gentleman and Robert Pim of the same town and county farmer. I have found some old documents that help me understand a little more about what life was like for my family in Ireland. To the Register appointed for Registering Deeds 128121 A Memorial of Deed for Lease and Release bearing date respectively the seventeenth and eighteenth day of December one thousand seven hundred fifty five made between John Nevill of Mountmellick in the Queens County, Weaver of the one part and William Wyly of Gilltown in the County of Kildare farmer of the other part. John Bagot of the Kings County Gentleman did by indenture of lease bearing date the second day of June one thousand seven hundred and forty three for the consideration therein mentioned _ to farm let unto the said William Nevill _ tenaments and crofts near the town of Mountmellick to hold for and during the natural life and lives of Henry Nevill, William Nevill and Joseph Nevill sons of said William Nevill and the survivor and survivors of theirs at the yearly rent of six pounds fifteen shillings a year. 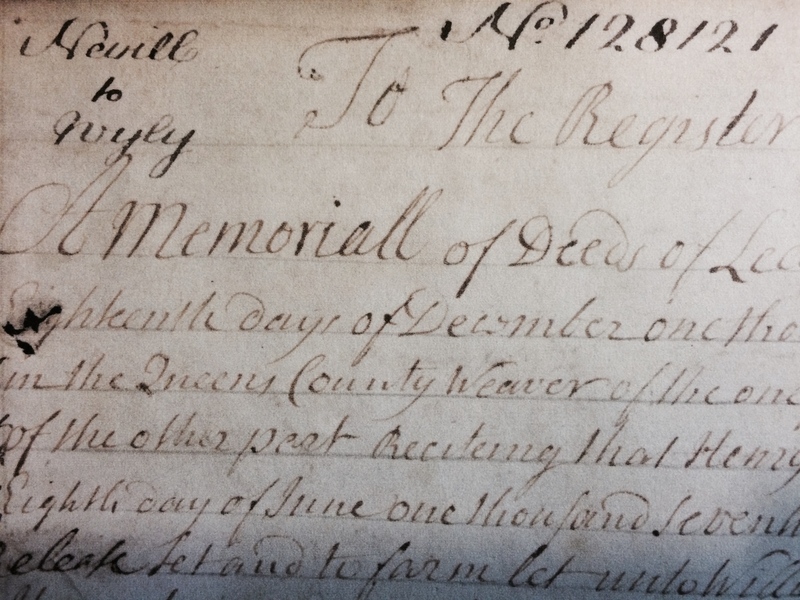 Said deed of release mentioned which said deed of ___ gave this Memorial are Witnessed by Thomas Pim of Tully lying in the county of Kildare Gentleman and Robert Pim of the same town and county farmer. I learned last summer that my Nevill/Neville family from Mountmellick were Irish Quakers. I am still working on this amazing family. Finding documents with witnesses and signatures are all pieces of their life. One deed mentions that William Nevill was a clothier and that deed also names three of William’s sons: Henry, William and Joseph. There was also a son from William’s first marriage. I am still working to transcribe these documents. But what a great project! 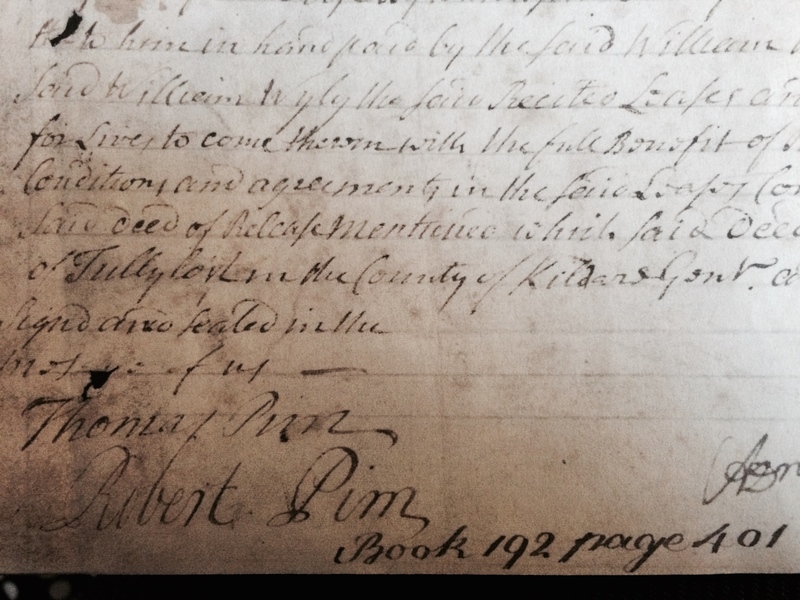 A deed from 1755! 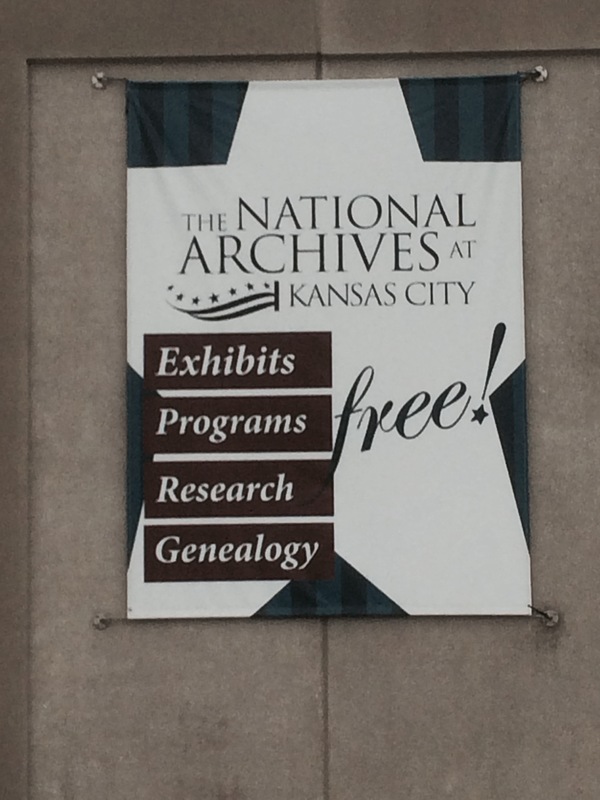 The A-files held in Kansas City are for individuals who were born 1910 and before. If your immigrant ancestor died before 1 Aug 1940 -no A-file. 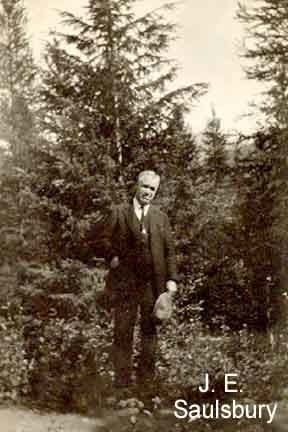 If your immigrant ancestor became a naturalized citizen between 27 Sep 1906 & 1 Aug 1940 – no A-file. Registered in the US as an alien in 1940 and came back to the Immigration & Naturalization Service for any reason (other than naturalization) after 1944 – Will have an A-file. Each file is unique. Most files contain the Alien Registration Form and Receipt Card – this for has 15 questions that your Immigrant ancestor answered. Sometimes you might find birth and marriage certificates. 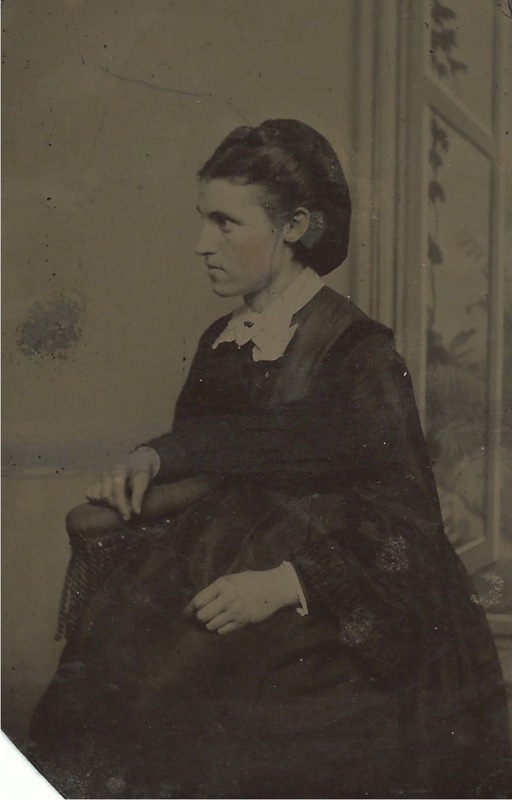 I did a search for Mulvihill – I found an A-file for Bridget Mulvihill born 1883 in Ireland.